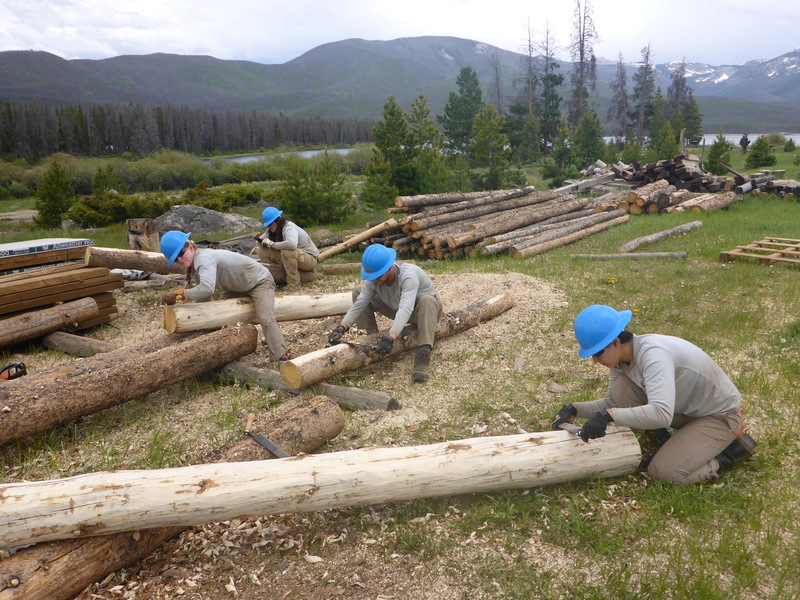 Believe it or not, Rocky Mountain Conservancy – Conservation Corps’ season is half over. 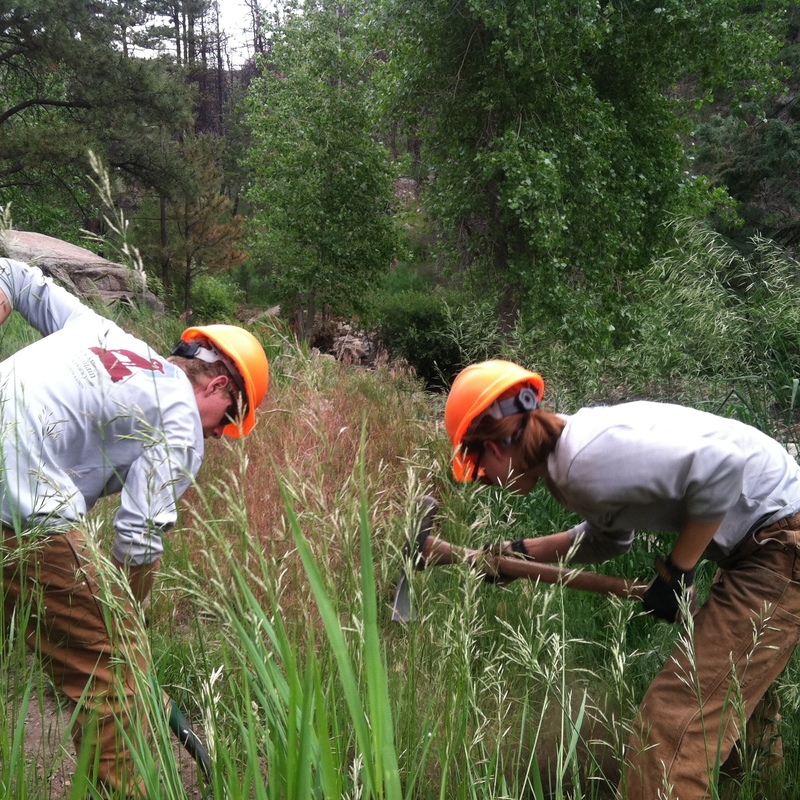 This past week all of the crews returned to Estes Park for Mid-Week. For the readers less familiar with our program, mid-week sits right in the middle of the season. The crews have been in the field for four weeks and will return into the field for four weeks. 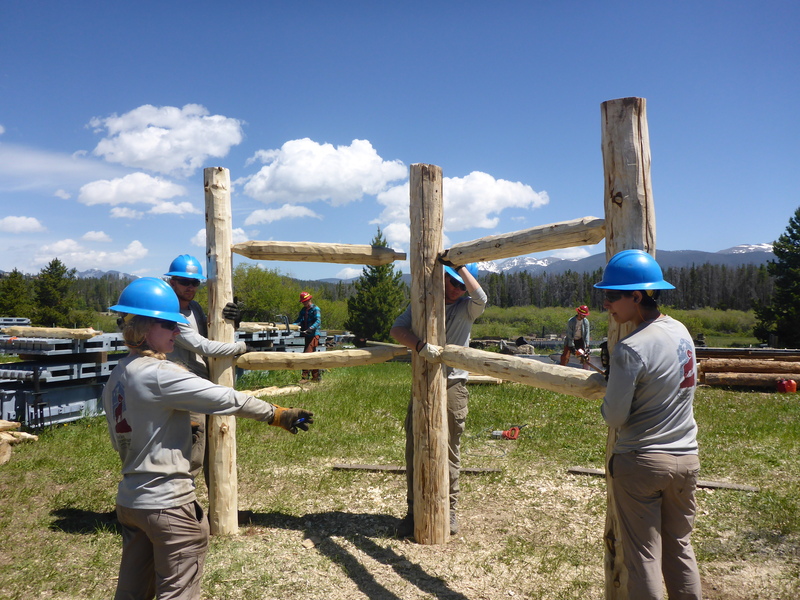 The focus of this break in the season is education; however, the week always begins with an all-crew work project in Rocky Mountain National Park. 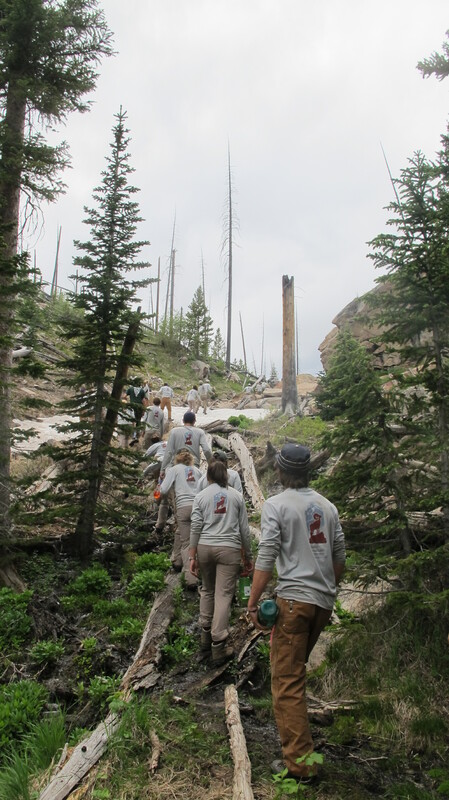 This year that brought us down to Wild Basin to help the National Park Service with the Ouzel Falls Bridge Project. 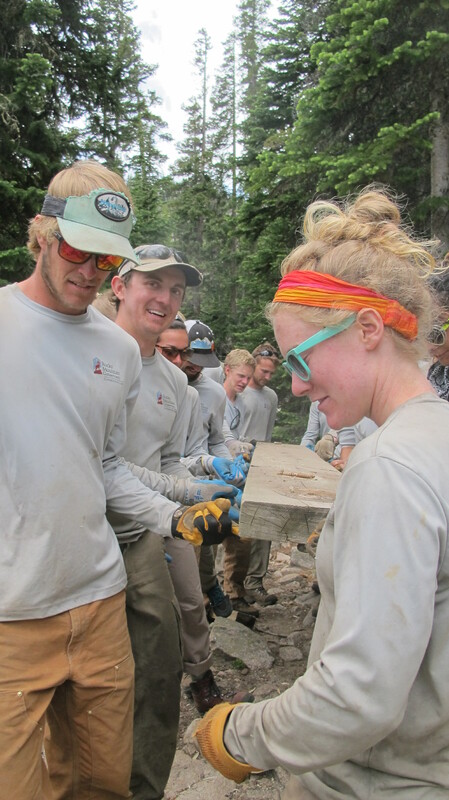 With seventy-eight hands on deck for the project, between the thirty-six crew members and Field Institute staff, the National Park Service was very grateful for our support. 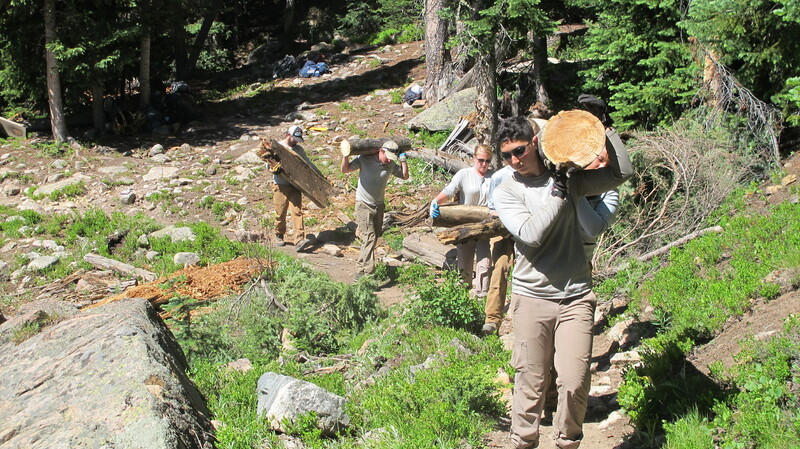 We spent the day dispersing material from past Ouzel Falls’ bridges that had been deposited just off trail in a huge mound further into the backcountry to expedite decomposition of the wood and create a space for the new bridge materials to be dropped and assembled. Danny moving some cut wood from old bridge projects. Mary and Holly navigating the pile of old bridge materials. Rebecca dispersing an old bridge railing. 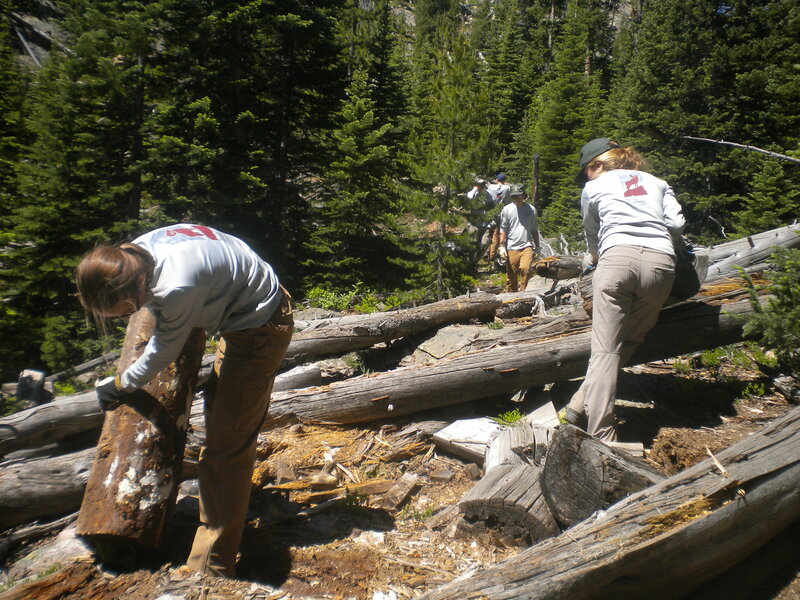 Crew members hiking some cut wood up trail. Connor enjoying some invertebrate fuel. Along with the day being full of fire lines shuttling material up away from the trail, we were forced to problem solve at times when removing log jams from the North St. Vrain River created by broken bridge materials using earthen levers and reading stream flows, when working to dislodge non-natural materials, like bolts, nails, and washers, from planks they had been wedged in for years, or when challenged to have eighteen people move a six-foot piece of pressure treated wood using only one-finger each. Tuesday and Wednesday were our education days. 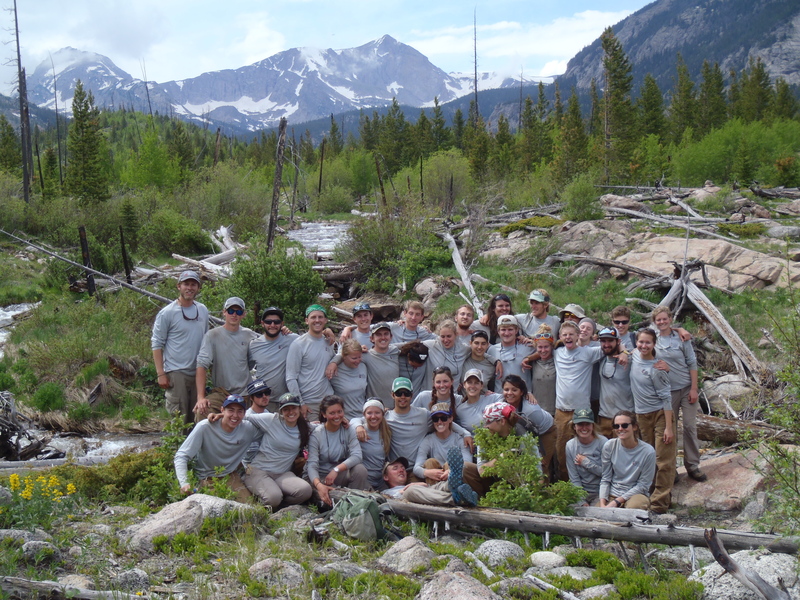 Both days each crew member had a choice of three different field classes to attend to learn more about Rocky Mountain National Park and the surrounding areas. On Tuesday, we had Vince Matthews, State Geologist of Colorado, lead a class on geology and glaciology; Walt and Marlene Borneman, historian and naturalist, lead a history of mountaineering hike along the Longs Peak Trail; and a number of crew members came out with me for a class on the history of stewardship in Rocky Mountain National Park. Crew members learning about the tundra and ancient peoples use of the landscape. Wednesday’s lineup brought the crew members through headquarters of Rocky Mountain National Park on a behind the scenes tour with Rachel Balduzzi, Education Director for Rocky Mountain Conservancy, offered others an opportunity to explore the Tundra with Interpretive Ranger Cynthia Langguth, and provided others with a natural history hike down the historic Ute Trail. The week finished up on Thursday morning with a number of crew meetings checking in on the season’s progress, evaluating individual goals, and assessing the needs for each crew as we move into the second half of the season. All in all, it was a great week. I enjoyed having the crews back in Estes, but am looking forward even more to visiting them in the field over the next few weeks! It is an established fact on the Rawah Crew that the best day of the week is Tuesday. What makes Tuesday so wonderful is a simple alliteration that sums it up nicely, “Taco Tuesday”. When you are 60 miles from cell phone service, restaurants, grocery stores and expending 4000 calories (about 16,500 joules) in a day little is more satisfying then a good dinner with friends. Take for example the last Tuesday we worked in the Rawah’s. We started the day at 7:00AM as usual, proceeded to the Link/McIntyre Trailhead. 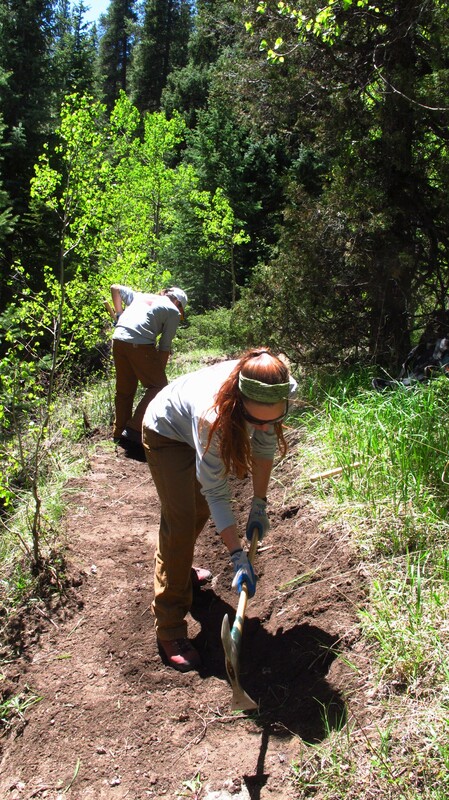 After stretching we spent the next hour putting in 100 feet of full bench tread (18 to 24 inches wide), by 9:00AM we were finished and moving onto our real project of the day – Blue Lake Trail. Rock bar (18 lbs), Mini Rock Bar (12 lbs), Mash hammer (4 lbs), 2 Picks (8 lbs), 1 Pulaski (5 lbs), cross cut w/ essentials (10 lbs), Felling axe (4 lbs). Being the crew leader and the architect of this heavy scheme I selected the Mash Hammer and felling axe to attach to my pack (30 lbs on average due to water). To top this off I also grabbed the large rock bar to carry in on my shoulder. With everything set we proceeded down the trail for a bridge we had never seen, at an undetermined distance with no guarantee of snow pack being higher than our goal. 4 miles later we started hitting snow drifts. 1 mile later the snow was too deep to effectively proceed. We stopped and took lunch, it was noon-thirty. After lunch we began working back towards the truck doing the work we are good at and accustomed to: Drains and fallen tree removal. After cutting and moving 11 trees out of the trail (7 on the ground, 4 leaners) and doing thirty-aught drains. We were back at the wilderness sign (~3 miles from trailhead). It was 1600 hours. Tooling up we hiked out, hitting the truck at 1720. All told we had done a significant number of drains and logs, but failed to achieve our goal of removing the bridge. Or for that matter, even seen the bridge. Once we had packed away our tools we split into two groups, as our work day had ended: One group to fish (Chris and Ben) and one group to return to the bunk house (the rest). We arrived home at 1800, 30 minutes over schedule, and began to recuperate from our day and begin cooking. 2 hours later we had the taco meat (chicken) cooked, cheese grated (cheddar), lettuce cut (red and green), rice and beans mixed, tomatoes chopped, salsa dished (mango), sour cream out and taco shells (hard and soft) ready. Ben and Chris were still out on the water, after waiting a charitable 5 minutes we began eating. Eventually they would return and gorge with us, we would finish all the food and relax into a food haze. Then we sleep, and do it all over again. Another 10 to 15 miles of hiking, another day of dripping sweat. Its not easy, its not always fun, but its worth it. Our bodies hurt, our hands and arms bleed from brush, our minds are bent to repetitive menial tasks, few say thanks – or even know we exist. But to have the pleasure of working in a small group with people you like in some of America’s most beautiful landscapes and at the end of day still be able to have an awesome taco? It’s a dream I rue to wake from. It’s Sunday, and you know what that means… Its time for a field update from all of the crews! Here’s an eyes on the ground experience of each crews’ experience this last week. 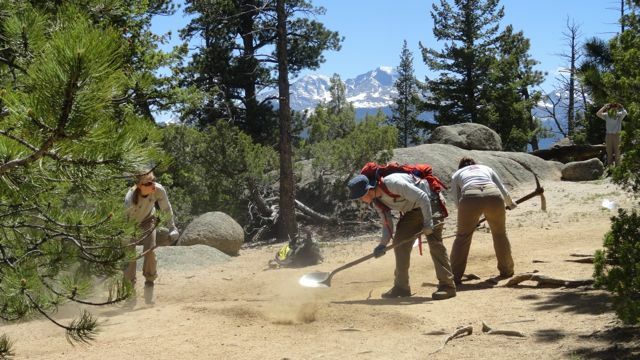 The Boulder Crew just wrapped up their fourth work week and the trails of the Boulder Ranger District are starting to shape up. The crew started the week with the completion of a 100 yard reroute on the flood damaged Dry St. Vrain Trail. 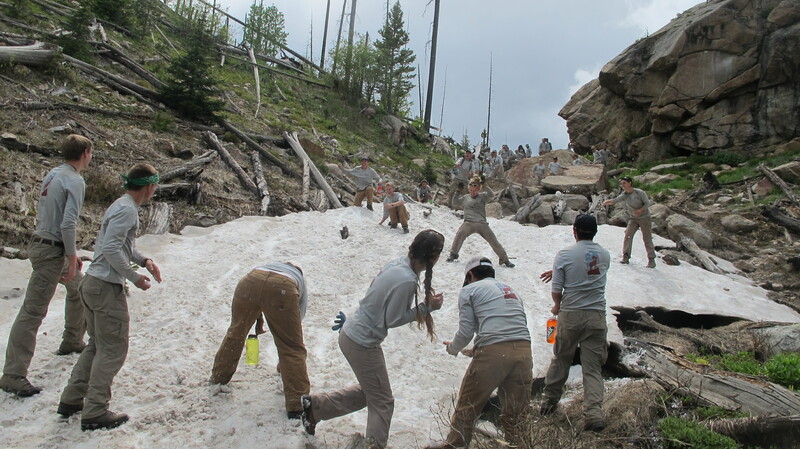 They then set their sights on the Buchanan Pass trail where heavy Spring runoff and poorly draining tread combined to create a muddy mess for the Boulder crew. Fortunately the mud was no match for this fearless crew. After RMC-CC was finished, the Buchanan pass trail was draining better than something that drains really well. After two days at Buchanan pass, the Boulder crew busted out two miles of drainage and brushing on the Sourdough trail to cap off the week. As the first half of the season comes to a close, the Boulder crew seems to just be getting warmed up. 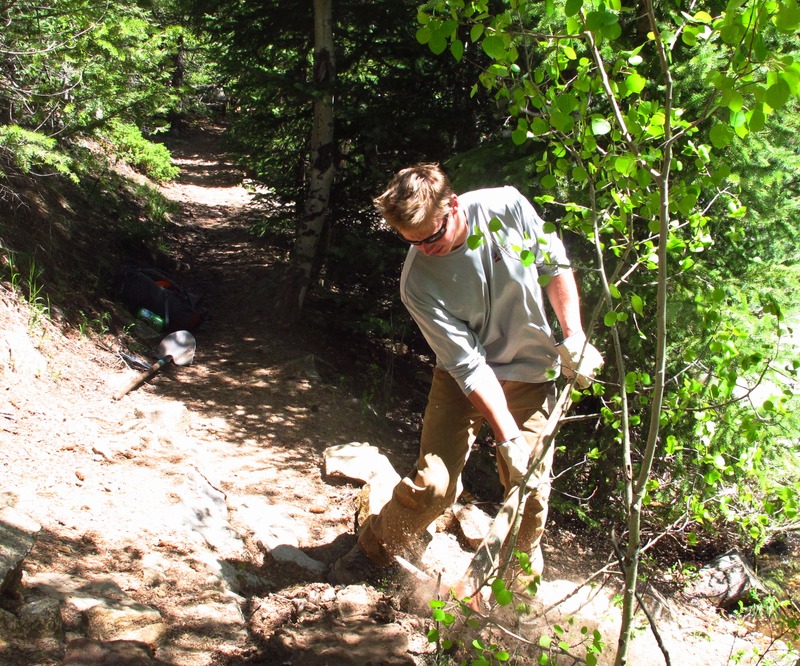 One of the crew’s strongest drain engineers, Danny Misch, recently stated that the Boulder crew is “a real powerhouse… a force to be reckoned with” and that “…trail erosion doesn’t stand a chance”. With this much momentum going into the second half of the season, everyone is on the edge of their seat waiting to see what trail they will repair next! Estes Crews had another solid week on the trails. 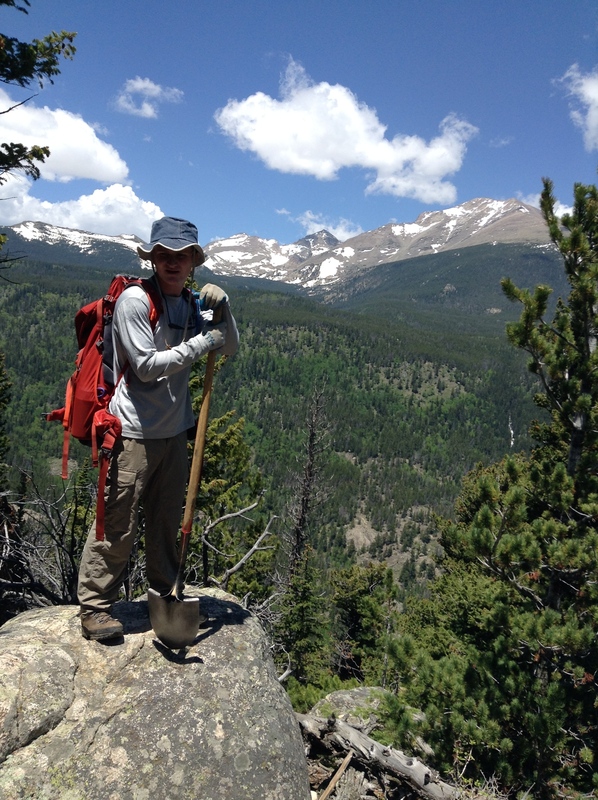 On Monday we started from the Longs Peak trail head and cleared trail to Lily’s Lake. We cleared about six miles of trail and then helped lay down new gravel on the trail around Lily’s Lakes. 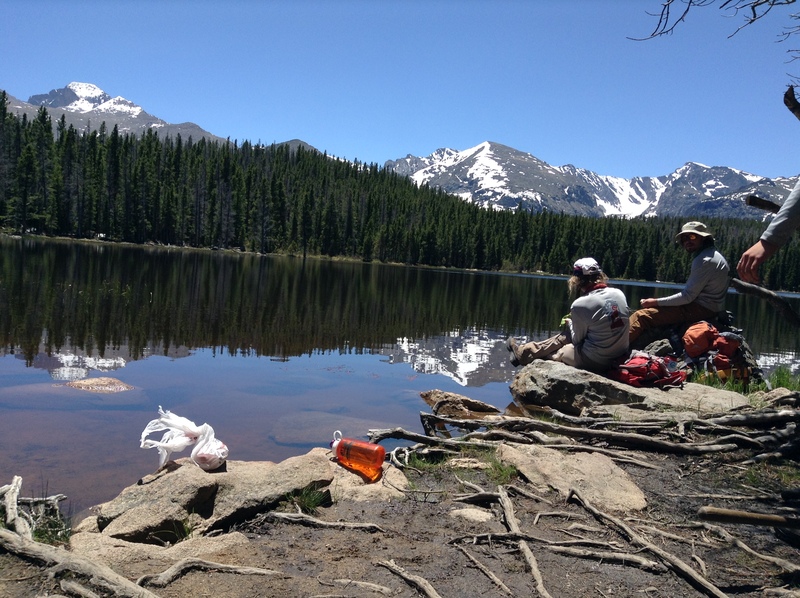 On Tuesday we started up the Lawn Lake trail and cleared about the first five miles before hiking out. Wednesday we completed the entire Lawn Lake and Black Canyon loop all the way to Lumpy Ridge for a total of about fourteen miles. There were also three large snow covered trees on the trail by Lawn Lake that we cut out of the way. 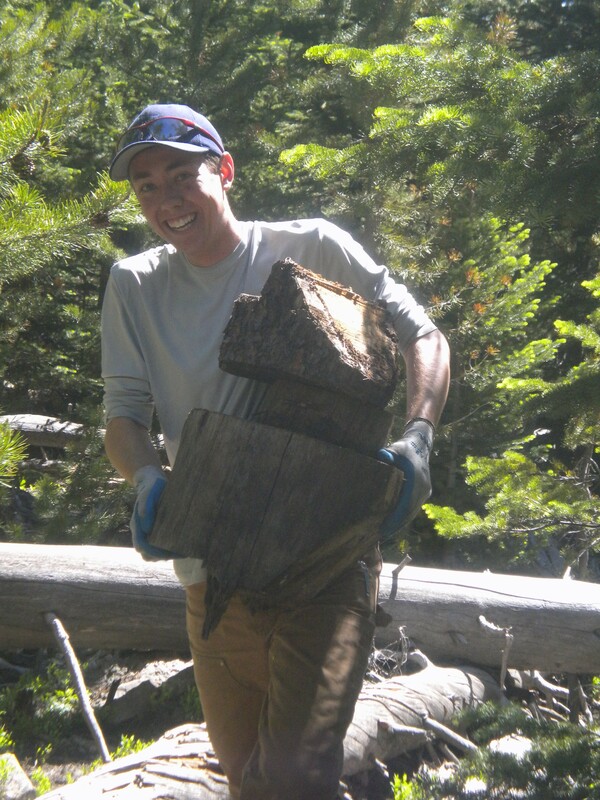 Thursday we started up high at the Ute Crossing Trailhead and cleared about six miles of trail to Beaver Meadows. 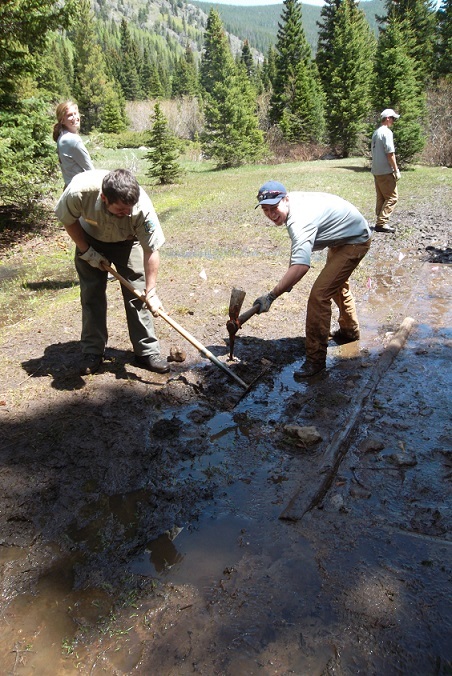 At Beaver Meadows we assisted with helping move stock to put fresh dirt on the trails around Beaver Meadows. 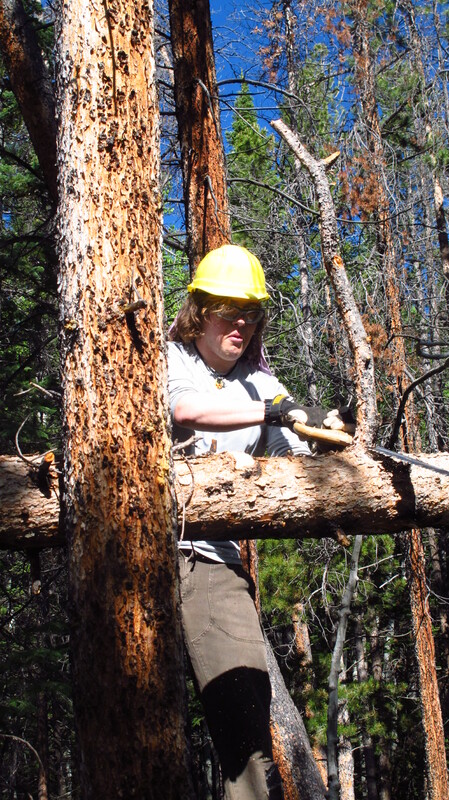 This week, the Shadow Mountain Crew got Chainsaw certified! At one point those fierce tools may have been intimidating but after a week at the Shadow Village chainsaw class, we can all operate them like stellar grade A Sawyers. Tuesday and Wednesday were spent in the classroom learning about the odds and ends of Chainsaw wielding, cleaning, dismantling and anything else you could possibly imagine. 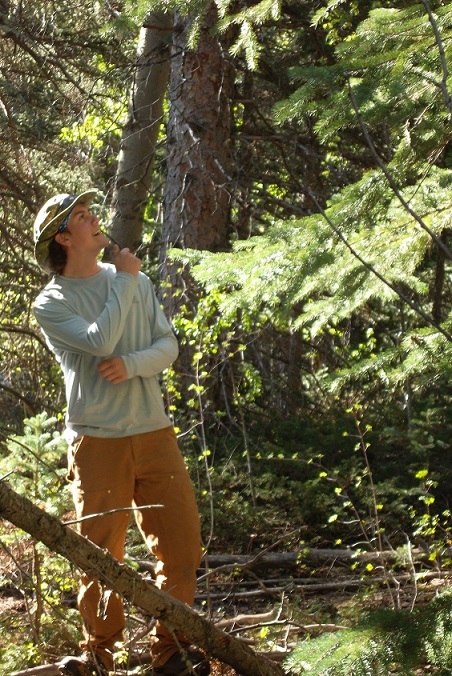 On Thursday and Friday we got to test our newly acquired knowledge in the field on the hazard trees around Beaver Creek. Each student had to fell 3 grade A trees which were then scrutinized by the respective supervisor who either passed them or decided a little bit more practice was needed. We were also tested and strictly graded in the bucking and limbing areas of expertise. Everyone passed with flying colors! Saturday the crew finally headed out into the field on the Strawberry Bench and Doe Creek Trails. 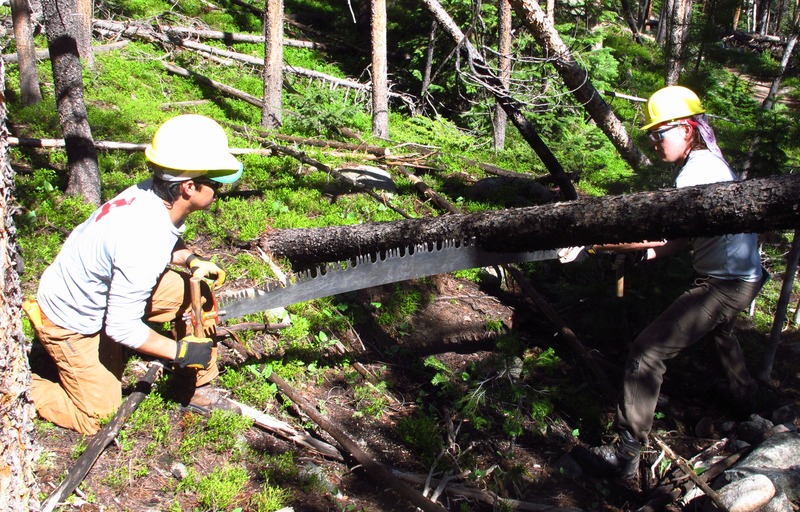 An outstanding 18 miles of trail and 71 trees were cleared and members tested out their newly found saw skills. All in all, it was an extremely productive and satisfying week. Tommy, Aidan, and Lewis working to establish a new tread on a swampy trail on the Strawberry Bench. Aidan using his chainsaw training on the trail. 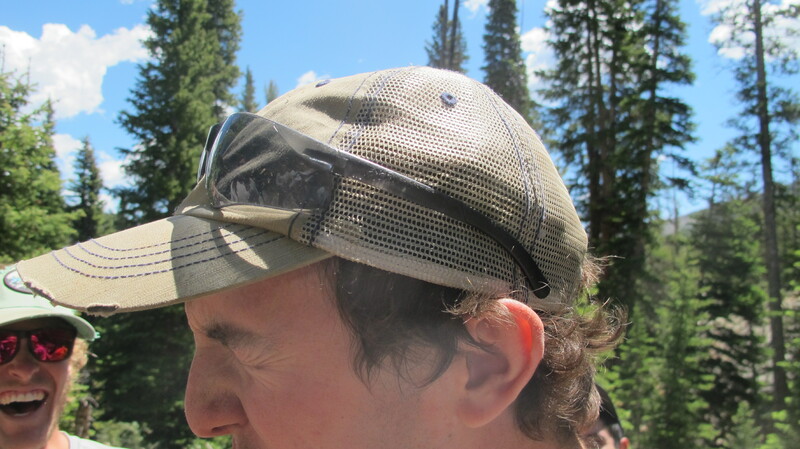 This was our (Red Feather) first week working independently from the forest service. On Monday we went up the dead man road outside of Red Feather Lakes. We set out on the North Lone Pine Trail with one group designated to bucking out fallen trees and one group working on drainage issues. We found there was much more than a days work and needed a way to cover more ground. With this in mind I pitched the idea of riding North Lone Pine and Killpecker on a mountain bike and get eyes on the entire trail. I was surprised when our Forest Service supervisor was all for the idea. 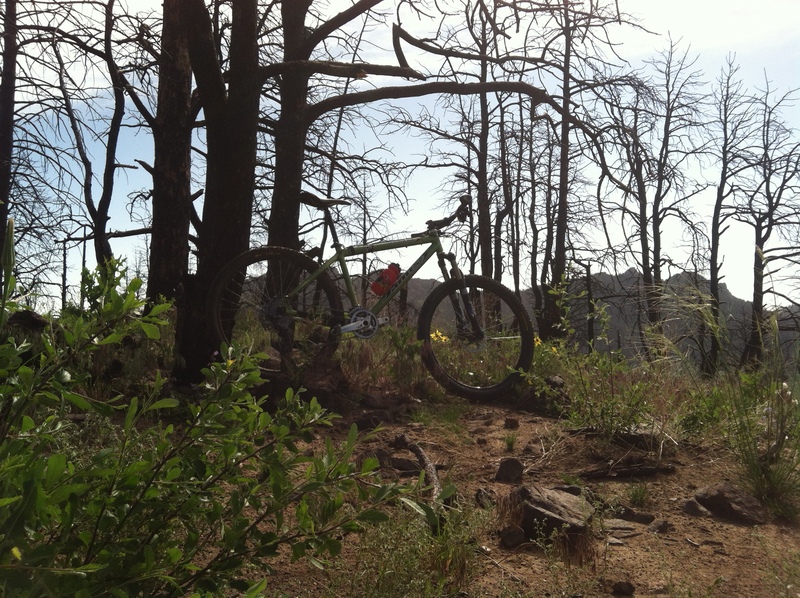 Tuesday morning I set on my mountain bike to see the top part of Lone Needle Pine and return on the Killpecker Trail. After enjoying the clear trail we had worked on yesterday I eventually found a trail filled with snags, fallen trees and snow that eventually became deep and consistent. I continued on to stick with the plan and found, what seemed endless potholing. 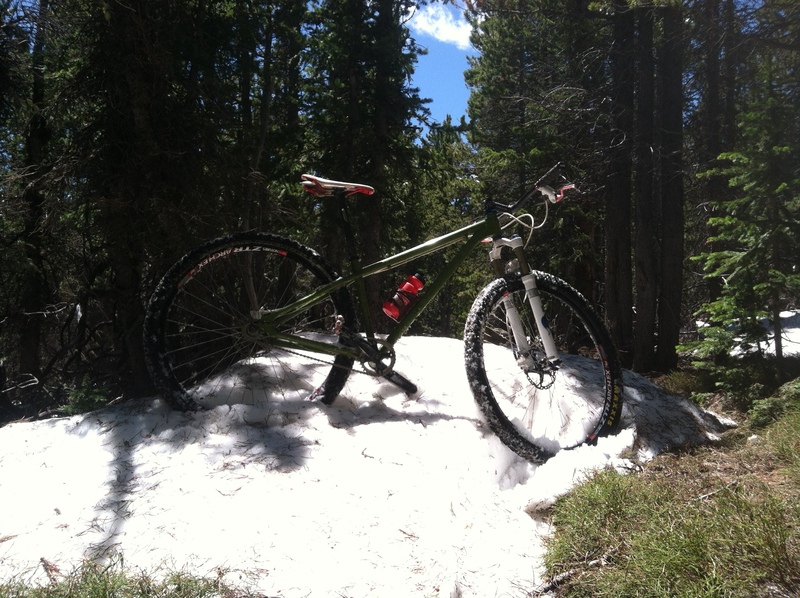 After dropping below the snow line, I returned to the Killpecker Trail with water draining down it. I eventually met back up with the rest of the crew and shared the story of my adventurous day. The following day I was asked to ride the Hewlett Gulch Trail and report what I had seen, The trail was a real treat with technical creek crossings and travel through an area that burned 3 years ago. It was great to get out on the bike and see all the ecological succession that has taken place since the fire all before lunch. After changing and returning to the rest of the crew who had kept busy lopping we began brushing in braided trail and cleaning and creating new drains. 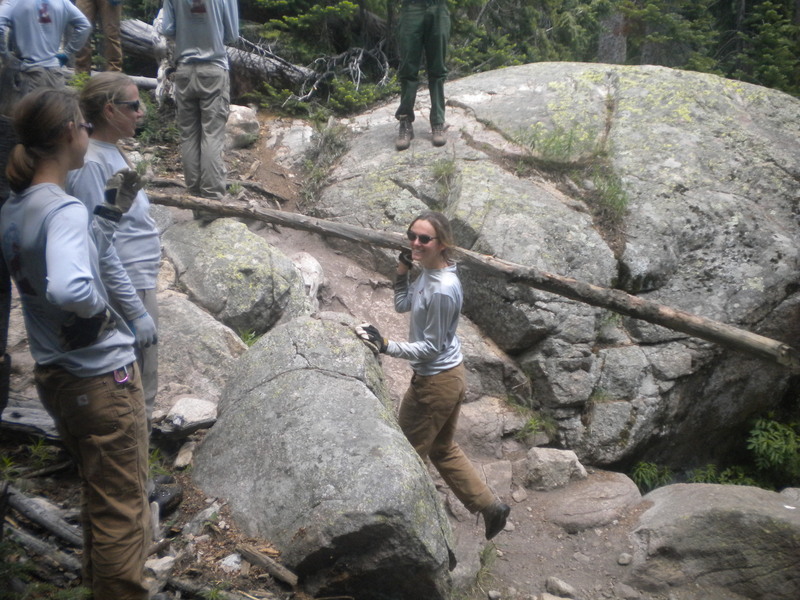 The week then ended with work on the popular Grey Rock Trail, just outside of Poudre Park. 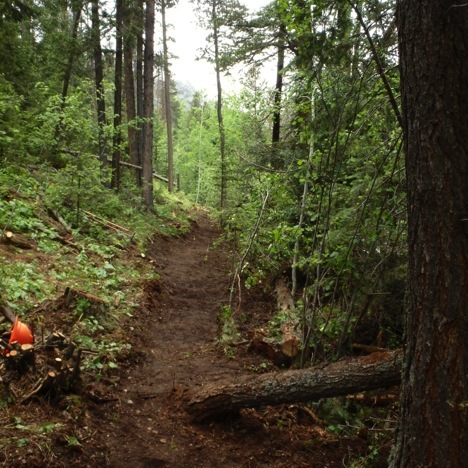 On this trail we promoted drainage by cleaning water bars and redefining rolling grade dips. The trail also required a fair amount of brushing and one repair to a rock retaining wall. The week was full of adventure and hard work and I feel grateful that I was given the opportunity to work off my bike for a couple days. 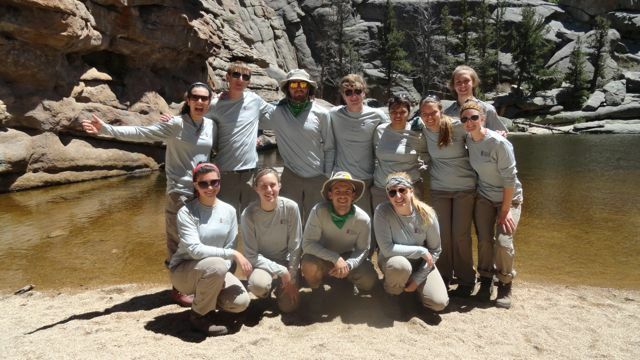 Rawah Wilderness Crews’ updates will come this week in the crew spotlight. 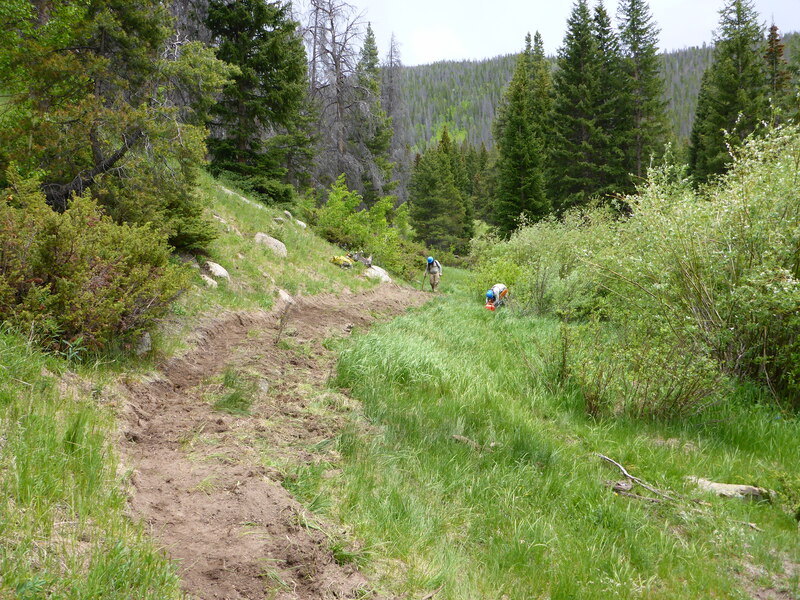 The Estes Crews were back at it again, making sure that the trails are of the best quality for park visitors. 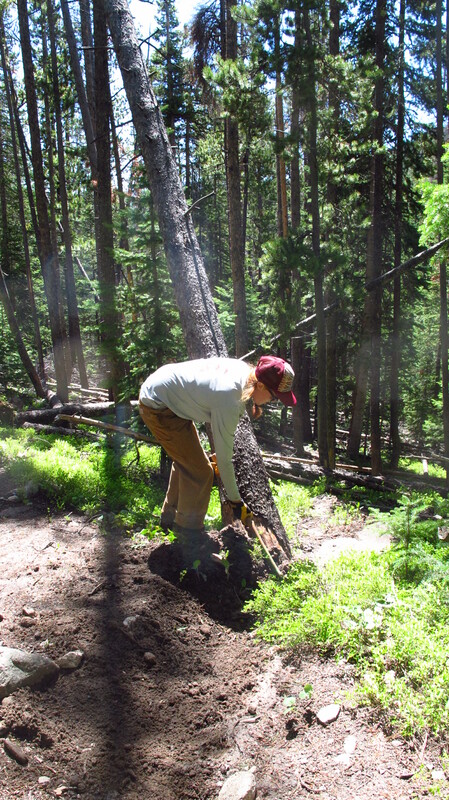 After a daily ritual of cleaning up the horse and mule stomping grounds, Monday took the crews to dig drains on the trail to Dream Lake in the morning. While that was the goal, this trail is higher in elevation and a large part of the trail is still covered in snow. The snow laden trail was cleared or made into steps so that it is easily hiked and visitors stay on the correct trails. 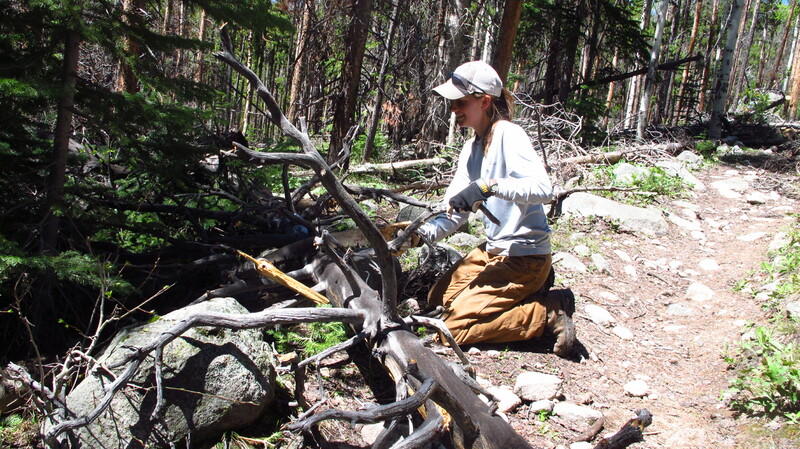 After completing this work we made our way to Bierstadt Lake trail, where we maintained the drains on the trail, and cut 8 fallen trees with the cross-cut saw. 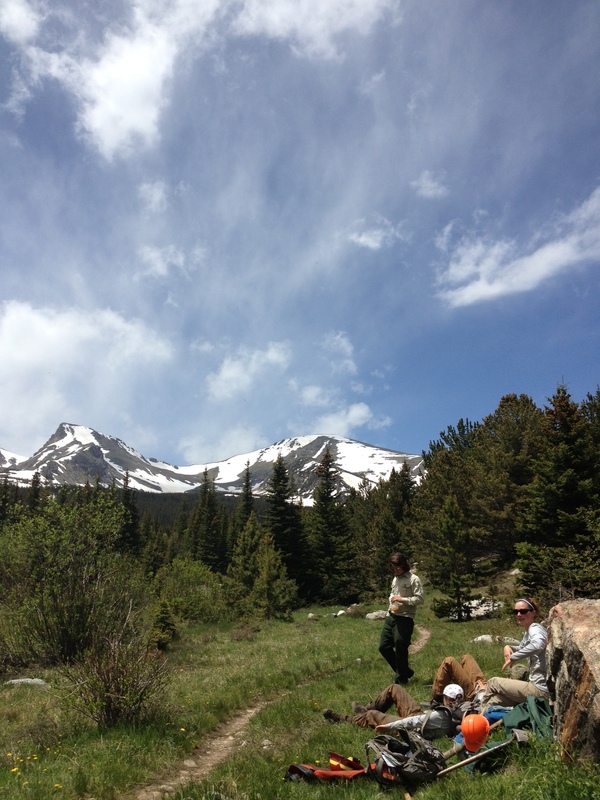 Lunch at Bierstadt was very scenic and relaxing. Wednesday brought the crew back to the Deer Mountain Trail Head. Instead of heading west, the crews headed East, around Deer Mountain, where the met up with their Supervisor, Dave Patrick at the East-most side of the mountain for lunch. Concluding lunch, there was serious weather starting to roll in, and head right towards us. Instead of chance continuing to finish the trail, the crew decided to make the safe decision and head down the mountain. Once they made it back to their cars, the weather had passed, and we made our way to the Moraine Park Visitor/Discovery Center, where they maintained the heavy trafficked discovery trail. Drainage dips were dug, as well as endstones were placed next to log checks to aid in directing traffic. At 3:30, The Estes crew made an appearance at the all park employee welcome Ice Cream Social, where they visited with other groups in the park, from all different types of crews. Tom had 4 servings of ice cream and justified it because he runs.. Concluding the ice cream indulgence, they went back out and worked on a tail to conclude the day, near the Beaver Meadows Park Entrance. 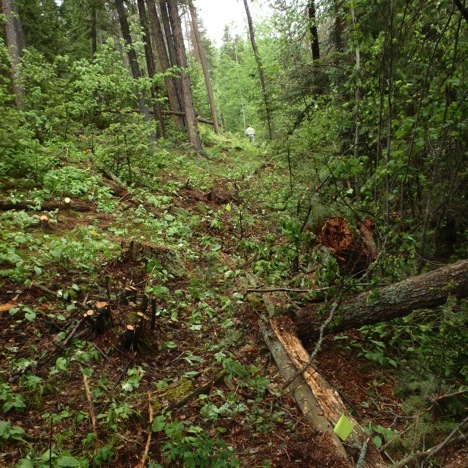 After a night of heavy rain, the crews made their way southward to the Wild Basin area, and began work at the Finch Lake Trailhead. This trail was different than any we had worked on so far, as the trail strolled through very dense trees and Aspen groves. 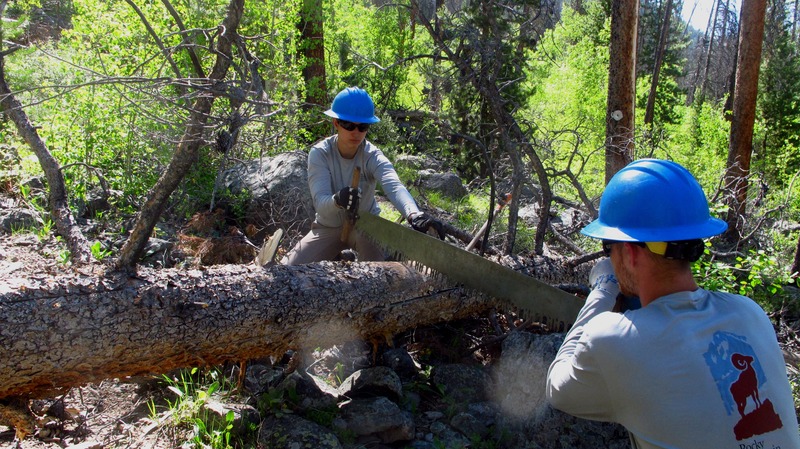 The Cross Cut crew, of three people, was busy all day, as around 20 trees were cut that were blocking the trail. The crew made their way in a loop and was fortunate to see Calypso Cascades water fall and put in a hard day of work to get the whole trail completed. Crew surveying flood damage on Thursday. A few members of the crews went to hang out with their families while others relaxed this weekend. Friday night Jackson was playing his Mandolin, and Bryce decided to try and play the musical spoons with him. While it sounded pretty rough, at least he “learned how to play”. Saturday, Emily led a final surge to finish the puzzle, and put all the pieces in that she could! 1 Piece was missing. Others relaxed and slept some, and a few of us, Margaret, Jackson, and Bryce hiked two 12‘ers, Flat top Mountain and Hallet’s Peak. 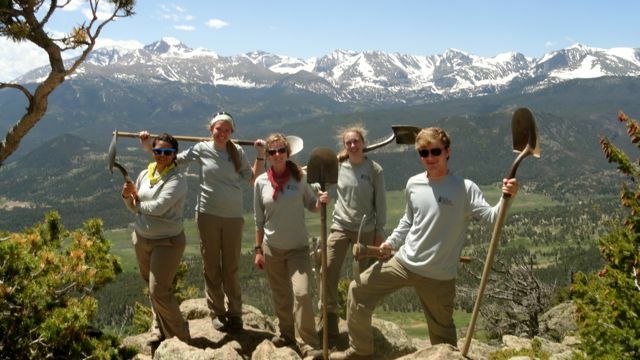 Two Saturdays ago (6/1) both Estes crews headed over Trail Ridge Road for the first time to visit the Shadow Mountain Crew. We enjoyed canoeing, a bonfire, and a cookout in the Shadow village. The next morning, we woke up and devoured an all you can eat breakfast at the Fat Cat Cafe. We drove home heavier and napped the rest of our Sunday. Monday, we all attended government regulated training day. They sufficiently informed us about the risks and standard operating procedures associated with the trail work we were completing. We finished the day with a 2 mile hike and a maintenance run on the Upper Beaver Meadows Trail. Tuesday, some of the crew is feeling sick and moral is low. But, Geoff graced us with his presence and we rocket through the morning clearing over 100 water bars and drainages. Some hikers gives us a hand lamp they found on the trail for us to deal with. Excitedly we turn it on, only to find out it doesn’t work. No one mentions the headlamp again. We stopped at the beautiful Gem Lake for lunch and all dipped our toesies in to cool off. At lunch we decide to hike another mile ahead and clean drains and then turn back to be back at the Trail Shop by quitting time. Little did we know that one mile was straight downhill and all that was on our minds was that we were about to have to hike straight uphill for a mile. We ease the pain by daring Hania to fit through a tiny carved hole in a rock during our next break. We hike the straight uphill mile in 21 minutes. On Wednesday, we start the day off normally, scooping poop at the trail shop to clean the house corrals when a rogue horse shows up outside the fence and riles the animals up. Delaney catches it with hopes of it joining the crews at the Chamberlain House. Unfortunately that was a no go. This is the day the Estes crews split up. 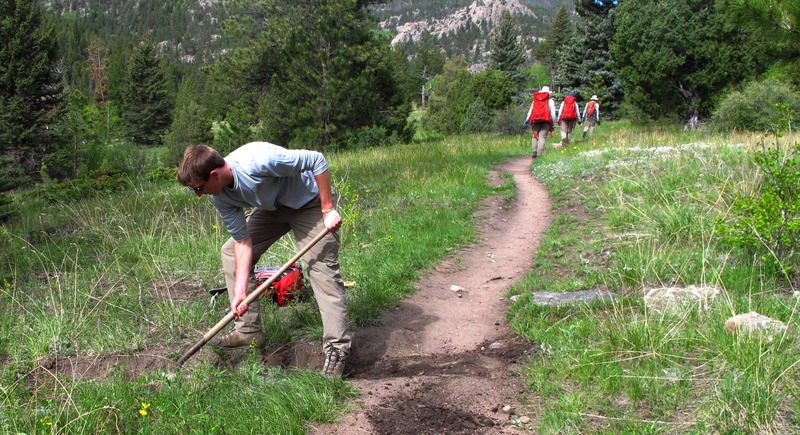 Half receive Crosscut Certification from Doug Parker, RMNP Trail crew. We have a blast doing bucking races and working with the park service employees. Tom almost gets the lowest time for bucking a log and impresses everyone. Our other half does a maintenance run on the Deer Mountain Trail which provides great views. We all return from work that day as a big happy family and Delaney’s Estes Crew decides to make dinner for Tom’s Estes Crew. We whip up two delicious lasagnas and everyone eats too much. On Thursday the Estes crews split again. At the end of the day, 6 of us became officially crosscut certified and the other 6 checked two more trails off our maintenance list. Quite a successful week with six members learning a new skill and five more trails maintained and ready for the summer season. We celebrate by enjoying the company of our new National Park Service friends around a bonfire. 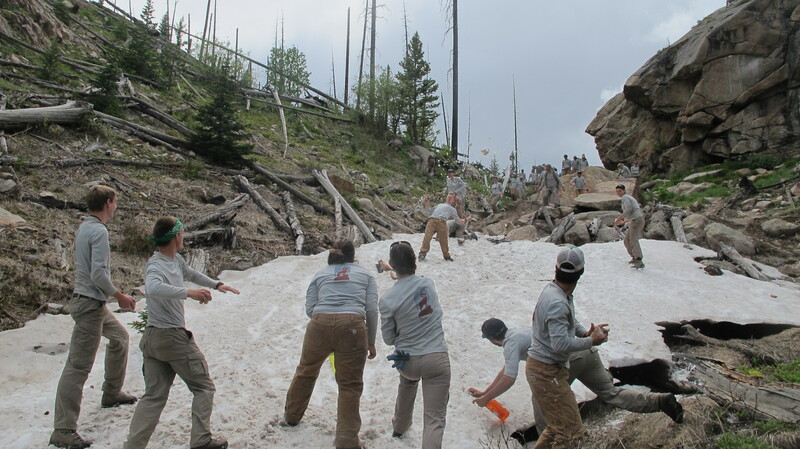 Friday, we woke up early to head down south for a weekend at the Great Sand Dunes with four of the six Rocky Mountain Conservancy – Conservation Corps Crews. We invited Julia who works for the Park Service and there ends up being 22 of us running up dunes and sand boarding down. 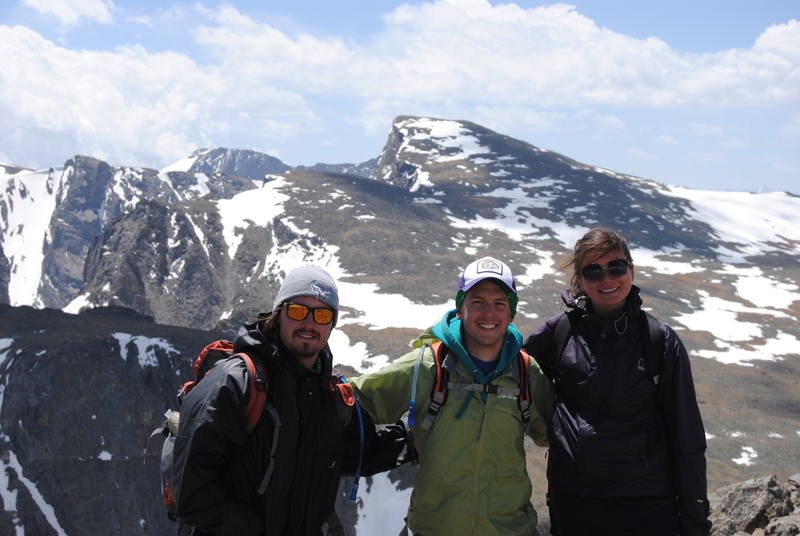 A small group decided to do a fourteener and successfully crossed Mt. Blanca off the To Do list. We all met back up at an all you can eat Mexican buffet and ate too much. Why do we always do this? We set up the tent village of 14 tents and hit the hay. After a small hike in the morning, we drive back to Estes Park. Everyone had a blast. How is the summer a quarter over? 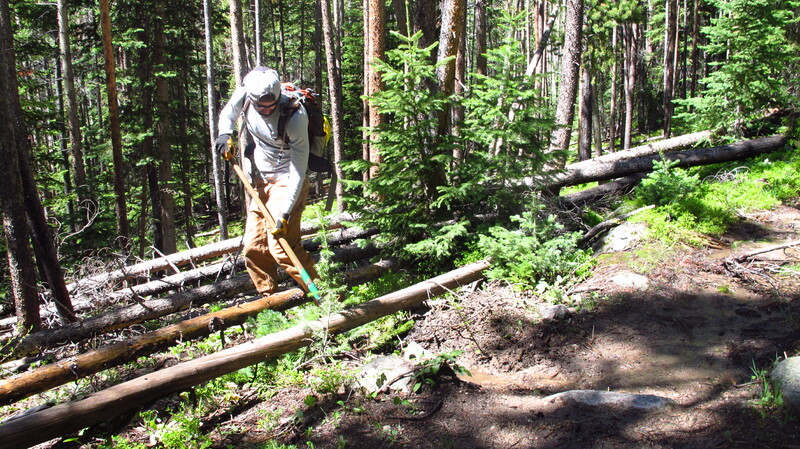 After the first week in the field, the crews have begun to hit their stride and really begin to knock lots of quality trail work. On Monday of this week I visited the Red Feather Crew, this day is documented in Spotlight – Red Feather Crew. The Red Feather Crew spent both Monday and Tuesday on the Lion Gulch Trail and maintained 2-3 miles worth of check bars and drains, established a horse ramp, grubbed out over 75 yards of tread for a rerouted trail, stripped about a dozen aspen saplings to create a reinforcement structure for a steep embankment along the edge of a trail, and moved between a few dozen large rocks to fortify that structure and prevent erosion. 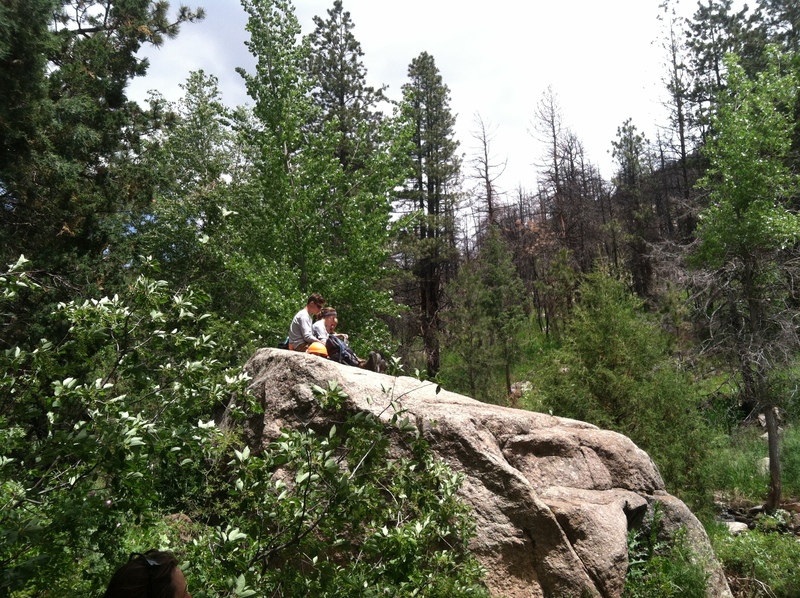 On Wednesday the Red Feather Crew moved to the Lily Mountain Trail in Estes Park. This trail was heavily affected by the flood and the crew is working to reopen the trail within the next few weeks. 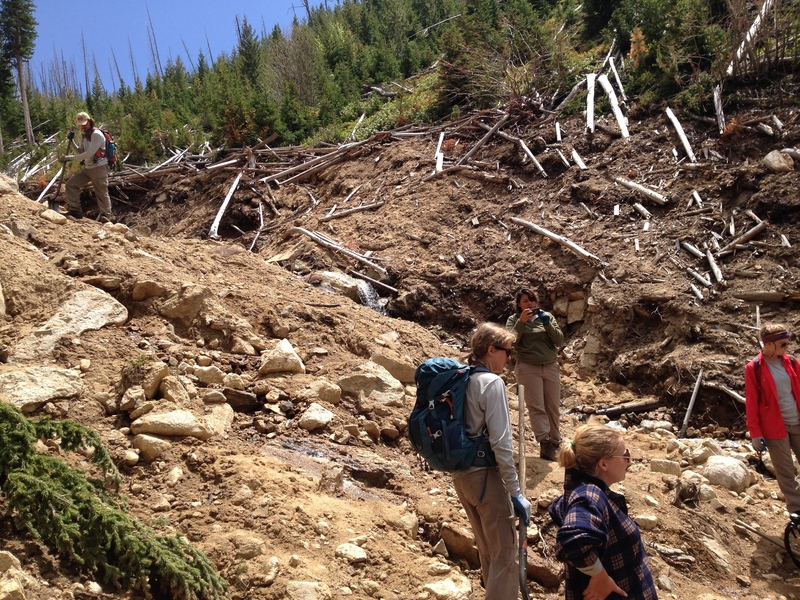 Last week they brushed over a network of social trails, maintained approximately 35 drains and a series water bars, used a rock drill to create new tread across an area previously devastated by a rockslide. They also established a series of stone steps leading up to that new tread. (Stayed tuned for pictures of this work). 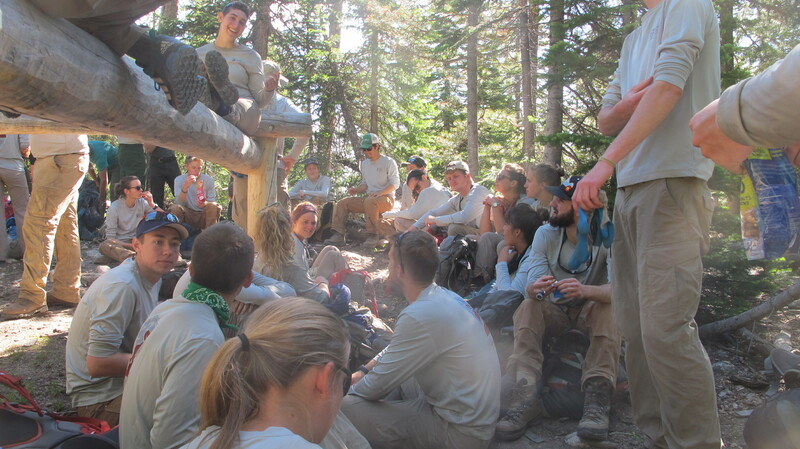 USFS Orientation kept the Red Feather Crew in Fort Collins on Thursday. The Red Feather and Rawah Crews reviewed the importance of customer service, JHA, USFS expectations, USFS infrastructure, USFS career advancement, general Safety Protocol, Incident Reporting, and defensive driving tactics. Off the clock the Red Feather Crew continue to enjoy crew dinners, outdoor activities, ice cream, and bowling. Both Estes Crews started the week by attending a training. The crews learned about plant species and wildlife in the park, safety concerns, defensive driving, and standard operating procedure of the National Park Service in Rocky. In the afternoon, we did a quick maintenance run on a .5 mile section of trail. On Tuesday, I was able to join the crews in the morning on a maintenance run of the Cow Creek Trail. We primarily cleared drains and did some limbing on the trail up to and just past Gem Lake. On Wednesday the crews split up. Six attended crosscut training and the other six completed a maintenance run. 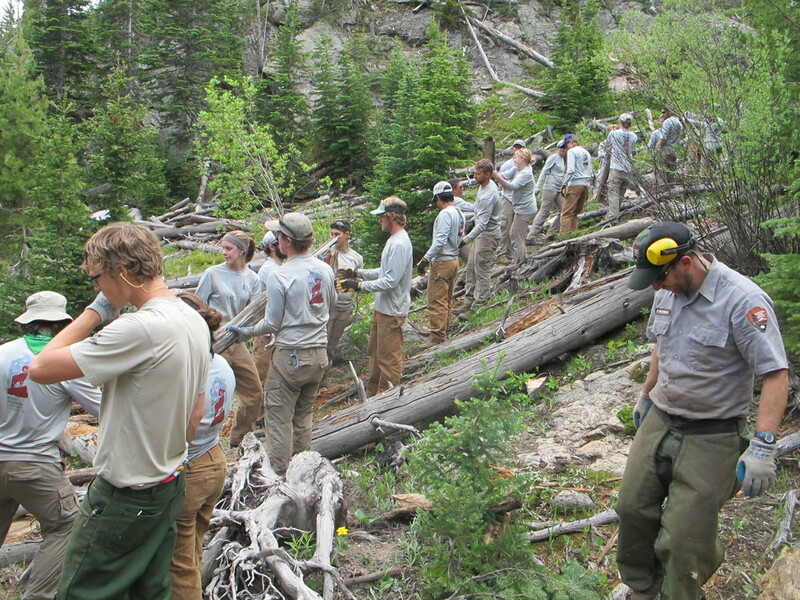 The crew on the maintenance run teamed up with Larimer County Conservation Corps on the Deer Mountain Trail. The other six attended a two day cross-cut sawyer training. On Wednesday, they spent much of the day learning the safety concerns, proper handling procedures, and correct implementation of a Cross-Cut Saw on the trail. 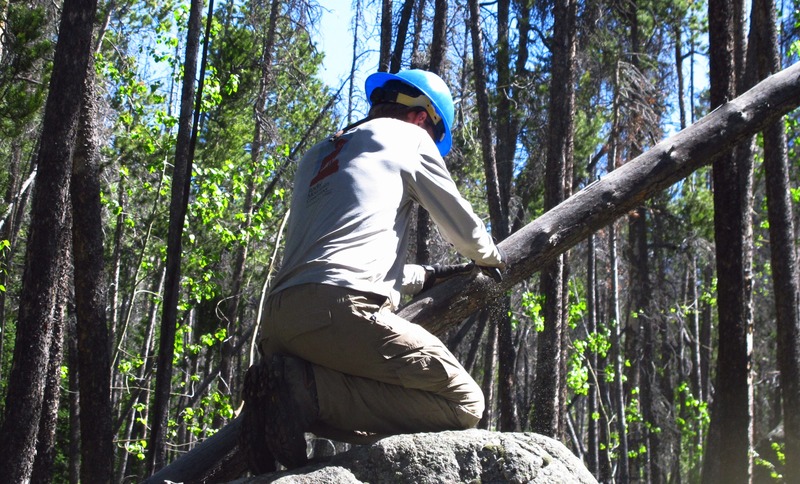 With this new knowledge the crews set out on Thursday to clear trees from some trails in Rocky Mountain National Park. This included the 5-mile Wind River Loop and the first mile of the Lawn Lake Trail. The other half of the crew completed the Lumpy Ridge Loop to finish off the trail we began work on on Monday. Assistant Leader of the Boulder Crew, Courtney, provided a full update of the crews activities from this last week. Please see below for her reflection on the crew’s second week in the field. After a long four day weekend Boulder Crew hit the trail again on Wednesday and Thursday to finish up our work on the Ceran St Vrain Trail. Jake, Steph and Danny worked hard at building a rock wall and completing tread work towards the trailhead while Joey, Holly and I worked on a stream crossing, helped remove hazard trees, and also finished tread work up the trail. 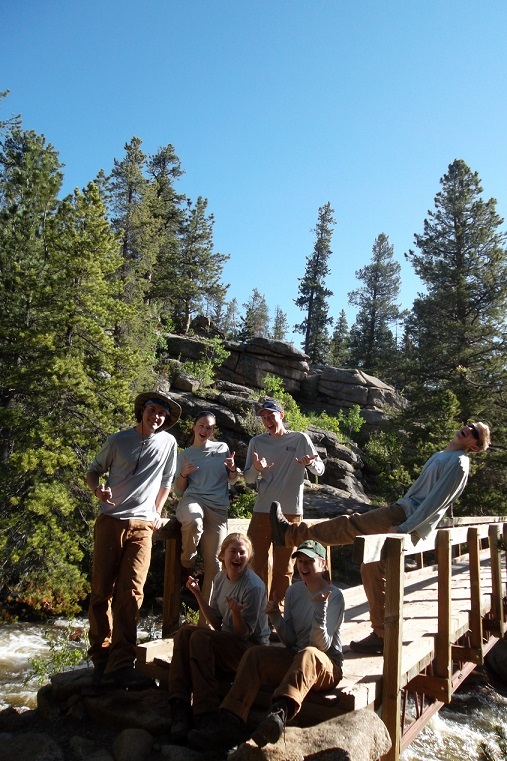 In five days our eight person crew completed 1.9 miles of heavily flood damaged trail! Courtney and Steph widening eroded trail. Jake clearing brush to build a rock wall. 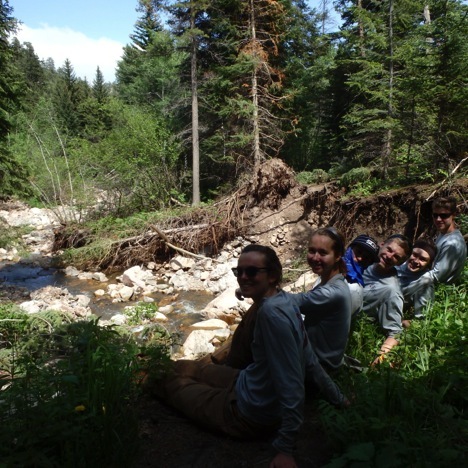 Boulder Crew after completing the work on the Ceran St. Vrain. After completing the Ceran St. Vrain trail we moved farther north to the Dry St. Vrain Trail on Friday. The main work on this trail was completing drains. In one day we added over 20 drains in heat and sun! 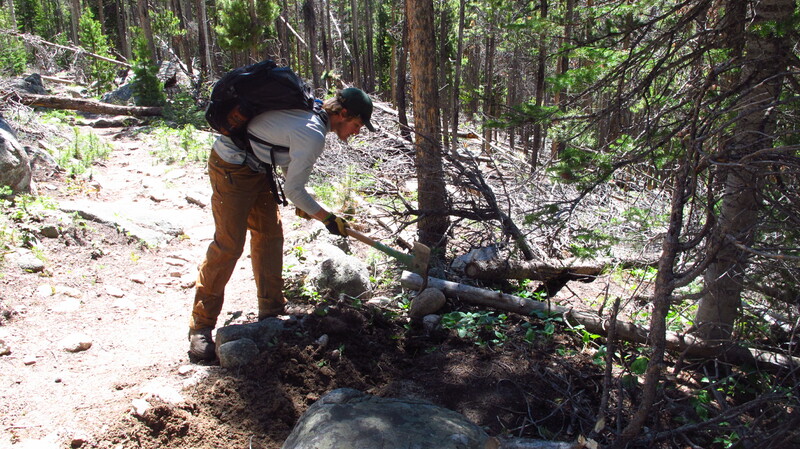 On Saturday, we celebrated National Trails Day by working on a more heavily used trail, the East Portal Trail in the James Peak Wilderness. The morning started off quite chilly but they warmed up right away digging borrow pits to fill in turnpikes that Paul (USFS Trails Supervisor) had started on, but not finished last season. Finishing that project up quickly, we moved on to a very muddy portion of the trail. Ankle deep in mud we made several drains to draw the water off the trail and placed heavy rocks on the extremely muddy sections. Danny was the most enthusiastic about this project. Having studied soil science at Purdue University, he shared his knowledge of the different soil types with us. I have a blast working with the crew! Some days are long and repetitive, digging out drain after drain but we have found many ways to entertain ourselves. Passing by each other, moving onto the next project, we say hello in funny accents; Danny has quite the Russian accent. Holly and I have made it a goal to master beat-boxing by the end of the summer, and Joey has been quite the model, striking poses in hilarious nature shots. Also, we have been trying to identify as many plants as we can by looking at my plant guide. 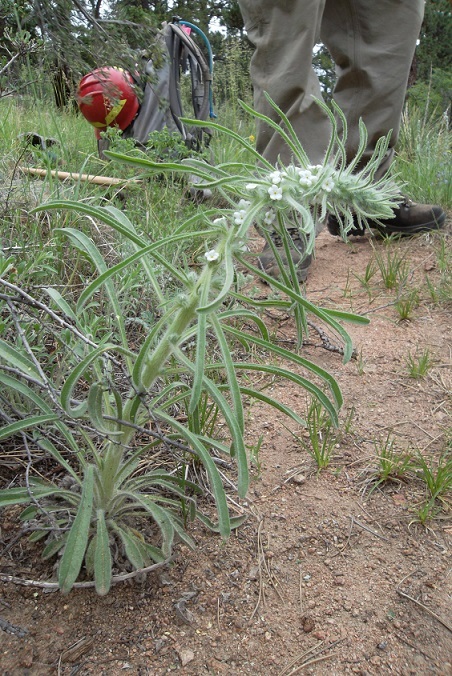 There was one that we could not identify on the Dry St. Vrain Trail, so I showed it to my bunkhouse roommate Emily, who is on the weeds crew for the Forest Service, and she was able to ID it right away. 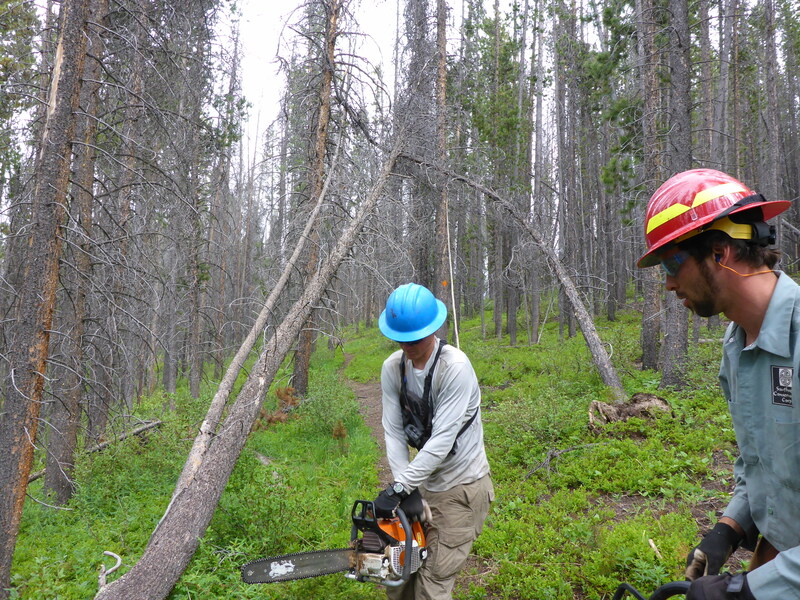 Shadow Mountain Crew began the week with USFS Orientation, but quickly transitioned into trail work on Wednesday through Friday. 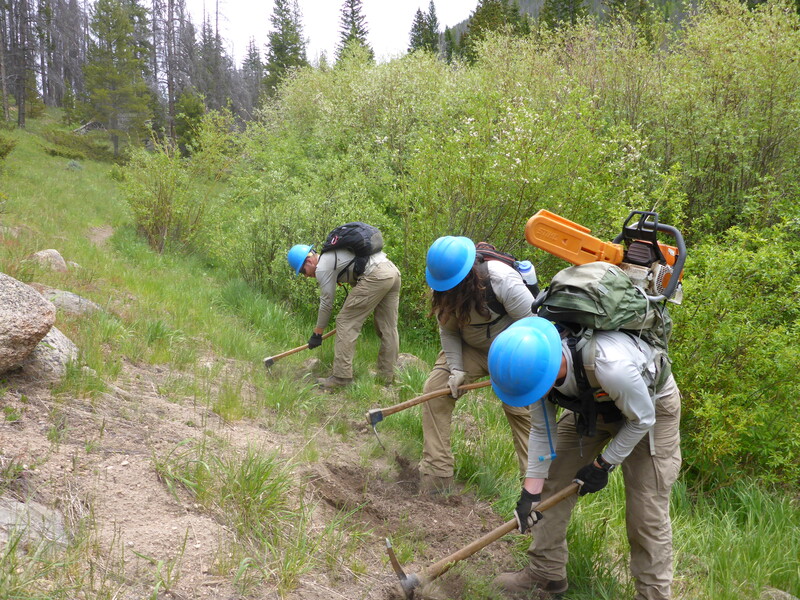 On Friday, Rachel and I were able to join the crew in the field for some work on the Roaring Fork Trail in the Indian Peaks Wilderness. Within the half-mile of trail, we encountered a downed log on the trail. Josia and Lewis were quick to assemble to Cross-Cut Saw and clear the trail. After hiking through a series of steep switchbacks, we were able to catch up to the rest of the crew as they sorted through a puzzle of hazard trees. Connor, Aidan, and I were able to clear the area with a Silky Saw. Aidan using the Silky to remove a hazard tree. The next section of trail brought a few more downed trees, and quite a bit of drainage work. 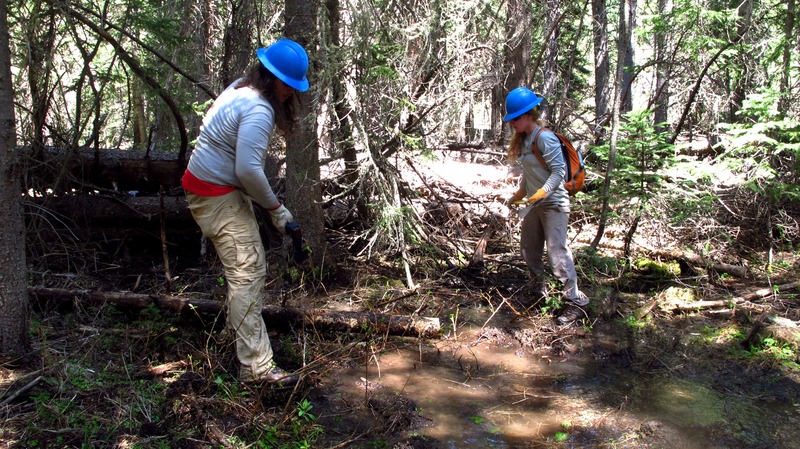 We all worked to dig drainages and clear culverts. Tommy and Shelby digging a drainage to divert water from the trail. This afternoon I am heading out to catch up with the Rawah Crew during their work day tomorrow, but this doesn’t mean they weren’t out on the trail last week. On Monday, they maintained three miles of the Big South Trail to standard by digging drains, removing hazard trees, and clearing the trail. 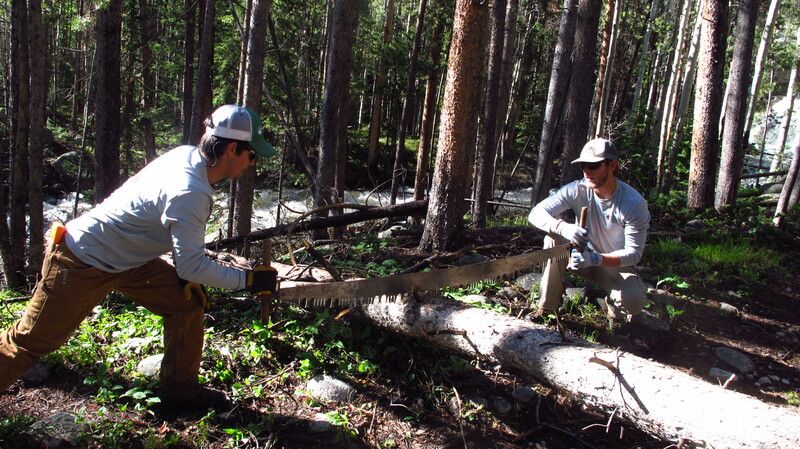 Tuesday brought them to the Roaring Creek Trail, where they completed over four miles of trail work, bring over 2.5 miles up to USFS standard in the process. 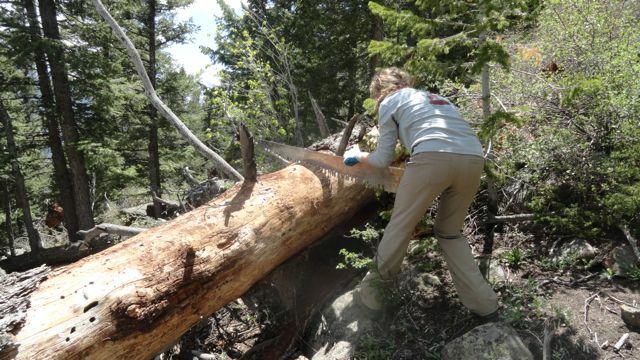 Before returning to Fort Collins for USFS Orientation on Thursday, they spent Wednesday on the Link Trail completing 3.5 miles of trail and 50 log outs of trees from 8-16″ in diameter. 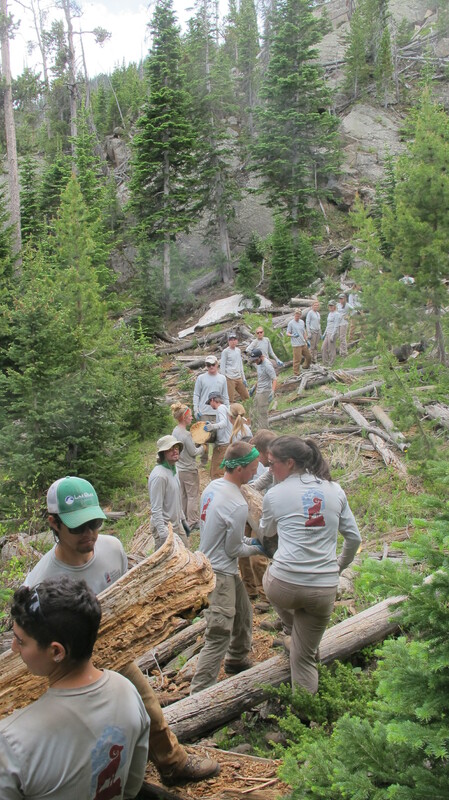 It was a great week for Rocky Mountain Conservancy – Conservation Corps. I had a blast joining the crews and participating in the work they are completing. Everyone is learning a lot and having a lot of fun along the way!